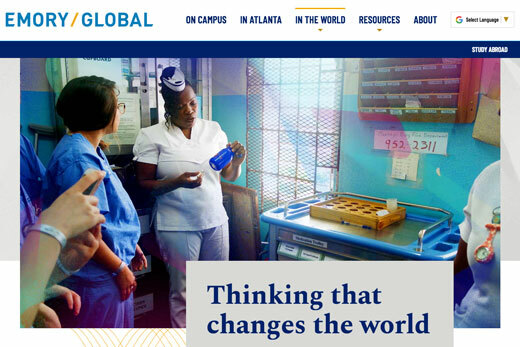 Emory University has launched a new website, Emory Global, to highlight Emory’s global impact for the university’s global audience. Developed by the Office of Global Strategy and Initiatives (GSI) in conversation with Communications and Public Affairs, Emory Global is designed to engage prospective international students and faculty who are in the process of determining if Emory is the right fit for them. The site also serves as a portal to resources for current faculty and students conducting international research. Providing a broad overview of the university as a whole, the site highlights the residential and intellectual experience of life on campus, as well as unique opportunities stemming from Emory’s relationships with the City of Atlanta and local neighbors such as US Centers for Disease Control, Delta Airlines, and The Coca Cola Company, among others. Visitors to the site can explore Emory’s impact throughout the world by learning more about the university’s thriving country initiatives for Brazil, China, Ethiopia, India, and South Korea or by exploring global faculty expertise and engagement through an interactive map maintained by GSI. Emory faculty, staff, and students can also use the site to explore research funding and exchange opportunities, along with other resources. Later this month, Emory Global will expand to include multi-lingual content in the dominant non-English languages of Emory’s five strategy countries and the US itself: Portuguese, Mandarin, Amharic, Hindi, Korean, and Spanish. GSI had recent stories from Emory’s news channels professionally translated and then vetted by faculty and advanced graduate students who are also native speakers. The language-specific sections are intended to grow over time as new content is translated and added, enabling a broader depiction of Emory’s activity in those countries and regions. If you know of a resource that should be included in the Emory Global site, please email global@emory.edu.